We all love stories – it’s the oldest form of communication, and has an incredible power to bring the past to life. 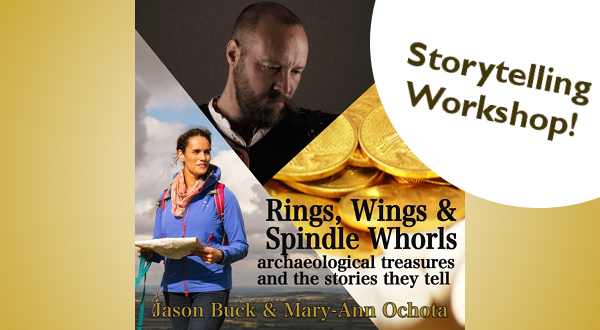 Join professional storyteller Jason Buck and TV archaeologist Mary-Ann Ochota for an afternoon workshop learning how to tell a story based on historical artefacts and events. Whether you’re interested in classic folklore, creating your own stories, or simply finding out the facts and sharing them in the most compelling way, we’ll bring practical exercises, tips and tricks, along with artefacts and documents to inspire you. In this relaxed workshop, you can participate as much or as little as you like. We’ll explore how to create and structure a story, and ways to see the scenes in your head and weave them into a story. Fun, creativity, characters and a whole load of historical yarns!